A family favorite, this delicious Mutton Biryani would be perfect for a family gathering or just to enjoy your weekend with your loved ones. This has been a highly requested recipe from you guys. But I have been delaying this post because I get nervous and fidgety even with the thought of making mutton biryani. Biryani means its always chicken, chicken, chicken; because it is easy and a little difficult to screw up. But with mutton biryani, its always a risk, I feel the chances of messing up are high. My biryani sometimes turns out like ‘Erachi Chor’ which is a one pot rice dish, just like mutton pulao/pilaf which is not how a biryani should be and it is very frustrating when that happens. So I stay away from making it mostly. But I was craving my moms food for long. Her Mutton Biryani is hands down, the best biryani I had in my whole life. Seriously, there is no place that is better than our home and no food tastes better than mom’s food. We don’t realize the worth of something or someone until we stay far from it/them. I can’t wait for my vacation trip to Dubai…I miss uma so much. 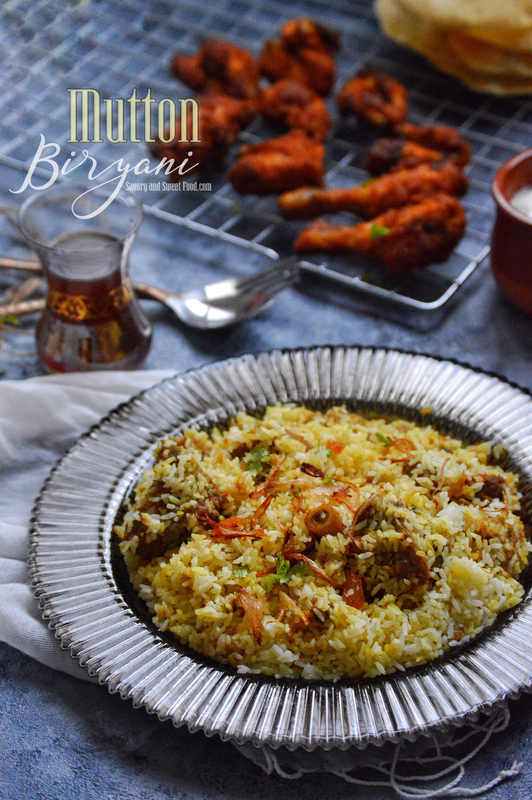 So here it is guys, finally…the recipe of mutton biryani for you all and if you are wondering if the recipe of that beautiful chicken fry is there in the blog, yes, here it is. Enjoy!! 2 tbsp lemon juice, 2 tbsp water plus 1/4 tsp turmeric powder mixed together or few strands of saffron soaked in few tablespoons of warm milk. Add in the coriander powder, turmeric and garam masala powders. Mix well. Add in yoghurt and stir till combined. Drop in the cleaned mutton pieces and mix well with the masala. Cover and cook for 1 1/2 hours on very low heat stirring occasionally, or until the mutton is tender and cooked. If you are cooking in a pressure cooker, cook for 15-20 minutes. Put the chopped coriander leaves. Mix well. The gravy should be thick. Place the fried onions, cashews and raisins. Cover with lid and keep for dum on lowest heat inside the oven for 30 minutes. If you do not have an oven, just cover the vessel with foil (to ensure the steam says in), then close the lid tightly. Heat a tawa on lowest flame possible, place the biryani on top and cook for 20-25 minutes. Make sure the heat is lowest both in oven and stove top or else the biryani bottom might get burnt. Hi, Sadia. Thanks for sharing the recipe. Yes, Mothers make the best biryanis. I would like to give this a try, but every time I try some mutton dishes, the smell of mutton stops me from having it. Is there a particular way to wash these to get rid of the smell. And do you use Pakistani/Indian mutton? Hey Sonam. You can reduce the smell to a great extent by cutting off all the fat from the mutton. I always use Indian mutton. Thank you so much. 🙂 Extremely sorry for replying so late. I was on vacation, so didn’t check the blog at all. 1 kg mutton will be enough for 5 people. Aha :). Thank you Rafeeda. Just wanted to say a big thank you for your wonderful recipe,tried it in the weekend and it was a big hit. Hubby loved it and your recipe is going to be my go to recipe for mutton biryani!